I wasn't being facetious! I genuinely didn't know about the 7 virtues on the Signoria and hadn't considered that other depictions (Baptistry doors, although with Humility as well) represented a trend. Your question remains: Why would the Florentines have removed the theologicals from the tarot before 1450, if they didn't remove them from her other personal/civil commissions of the virtues? Well, there are already pressures in that direction: a deck of cards is an object of practical use, and the theologicals are only 3 out of many more images in those cards. Perhaps some people did not like so much medieval Christianity in their playing cards, but more variety of subjects, with more contemporary references (e.g. astronomers, the Three Kings celebrations, new classical material on the three Fates in relation to the heavenly bodies). Also, the celestials could be construed as representing Time, in a superimposition of Petrarch's triumphs onto the cards (see below, the proposals by Lothar and Moakley, although what I am suggesting does not quite correspond to either). This was the time when Petrarch's Triumphi were in fashion, in cassoni and illuminated manuscripts, maybe also birth trays and other items. There is also the question, how long, if ever, would the theologicals have been on the cards in Florence? My proposal is that it would been good to keep the theologicals on the cards as long as the game was illegal, to present it as a pious game. Of course it is hard to say if they ever were in the cards in Florence. But I think it at least as likely as not, given their presence in Milan, the ubiquitousness of the 7 as a set, and that their presence in minchiate might be a survival from an earlier time. Whether the celestials are a Milanese invention is unclear. They do not show up in the Milanese cards until the 2nd artist, whenever that was. They are also in the d'Este and the Charles VI, both of which seem Florentine-derived. Ercole d'Este's marriage, which, it appears, the d'Este cards commemorate, was in 1473. Art historians unanimously attribute the 6 added cards of the PMB to Cicognara, whose work didn't start appearing until the 1480s. The Charles VI Emperor is similar in depiction to the Rothschild Emperor, cards which some art historians (Bellosi, Fiorini) date to the early 1430s or earlier. The Catania cards, also similar to the Charles VI, are dated by another historian (see "Catania Empress" thread) to the 1430s. These facts--I think it is right to call them facts--do not prove anything, but they are suggestive. At the risk of losing the preceding discussion (which I hope continues), I present, for more information, Franco's "1450ca: Trionfi e Triumphi", http://www.naibi.net/A/521-PETRAR-Z.pdf, in English translation. Comments in brackets are mine. I have not discussed it with Franco, so revisions may follow. I have a few more of my own comments to add, chiefly related to my own proposal cited by Franco, but they will come in another post. Petrarch's poem Triumphi ["Triumphi" in Latin, "I Trionfi" in Italian, "The Triumphs" in English] was composed over several decades and remained unfinished at his death in 1374. The triumphs, chosen so that the next succeeds in surpassing the previous one, are known as the following six: Love, Chastity, Death, Fame, Time, and Eternity. We are interested in their possible connection with the triumphal tarot cards. With reference to playing cards, precisely Francesco Petrarch is often quoted, but for another reason: as evidence that the cards had not yet been introduced in Europe by 1366, when he finished the De remediis utriusque fortunae; In fact, the cards do not appear in this work that indeed considers many games. The first documented information on cards is a few years later, in Florence of1377. Afterwards, the triumphs were also introduced, as the special playing cards, better known later as trionfi [tarots]; the first attestation of trionfi known today is that of 1440 in Florence. Playing cards and card games have never, or almost never, been the subject of academic study, and most of the contributions in this regard are by collectors or amateur historians. If anyone wants to find out about any particular topic and does not find texts on an academic level, reading the writings of amateurs or discussions on the web becomes the only way to learn more about them. links with playing cards, often to sensitive ears echoes the classic: et ultra crepidam! Here the sources are there, it is only to know how to look for them. Then, while belonging to the amateur category, I tried to make myself informed about the results of university research, and I can report a few things about them, including some fundamental contributions to the subject. I had studied the Triumphi already thirty years ago, but I had not arrived at a sufficiently defined vision. Taking up the matter again, I found of my interest a catalog with contributions by various authors (1), because it is recent, this fact is reflected in the utility of its bibliography: taking its cue from work of the past with later times it becomes less likely that fundamental studies on the subject will escape our attention. The contribution by Loredana Chines, "I 'Trionfi' di Petrarca", on pp. 17-20 of the work cited, would be of interest in itself, but I was particularly struck with the way in which in this regard the works of Marcello Ciccuto are cited, whom I did not know. On the importance of the antecedents of the Giotto cycles of Castelnuovo (paintings for Robert of Anjou) and Milan (for Azzone Visconti) for the illustres viri of Petrarch and the relationship between the Petrarchan text and iconographic texts, see the fundamental contributions of M. Ciccuto, “Trionfi” e “Uomini illustri” fra Roberto e Renato d’Angiò, in «Studi sul Boccaccio», XVII, 1988, pp. 343-402; the same, Figure di Petrarca (Giotto, Simone Martini, Franco Bolognese), Naples 1991, in particular pp. 5-77; the same, Per l’origine dei Trionfi, in «Quaderni d’Italianistica», XII, n. 1, 1991, pp. 7-20.
task, because they are works not present in many libraries, and because they demand the same reading. Fortunately, reading all three fundamental contributions has at least the reward of being able to note that these contributions are not three, but one. The text published in Canada is a broad summary, while the differences between that in the Italian journal and in the book are undetectable. In short, even as the author warns us that he revised his text for publication in the book, it is recommended not to look at the two journals and read the monograph only. Reading this part of the book (which contains later another couple of contributions of no interest to the matter) is highly recommended to any amateur who wishes to take the floor on the triumphs, both of cards and especially on Petrarca. Actually I do not know how many readers will be able to be convinced of the validity of this author’s work, in addition to Chines, but it is easy to see that at least the author was really convinced, seeing as he has made it public. If, as is known, academic books of a "scientific" type distinguish themselves by notes, filling the bottoms of pages with smaller fonts and smaller distance between the lines, this work deserves a fair recognition in its environment, such as others do not receive. In his book, I could find no page without notes; 17 notes out of 73 are whole pages filled with reduced characters; and of pages in which the upper part of the text is more extensive than the bottom, with notes stuffed with bibliographic references, I counted only two. Arriving at Note 43, which alone takes up two pages, I thought I had identified the longest, but I had not yet met note 46 which by itself takes care of nine pages. How does any amateur put his mouth [keyboard?] to the subject, after this exhibition of scientific superiority? To compete in the scientific field one should have recourse, as a minimum, to partial differential equation. of the Triumphi in Florence in illuminated manuscripts of the second half of the fifteenth century and those manuscripts of the previous half century, less known, less attended, without illustrations, also looking for elements of a discussion regarding the triumphs following in hierarchical order. Here the Florentine environment is not seen any longer; going back in time, the setting is much broader and instead emphasizes the fundamental contributions of other cities such as Milan, Naples, Padua and beyond; understandably, going back to the beginning of the triumphal personages, Giotto often appears in the discourse, as far as could be seen or expressed, in fact, in Milan, Padua and Naples. It is not possible to assess whether the net weight of the Ciccuto contribution was really decisive. Among other things, I have not found any particular comment on the sequence of the Triumphi, such that each element prevails over the previous one; it may be that it is spoken of in some other widely known note, but it seems to me that this feature is not discussed in the previous examples. Then I prefer to look for other high-level studies. In particular, I like to point to that of Ida Giovanna Rao (2), which has two unusual advantages: on the one hand it is as short, clear and as complete as required; on the other, it takes great responsibility, the kind you would want to meet more often: she has the courage to give us a list of publications on the same subject. So far it seems the least we can find in any serious study, but the selection proposed is explicitly suggested as a list of works that have brought an original contribution. In the Bibliography, in itself very abundant, is reported only those that gradually over time have proven very significant or innovative than previous ones, as well as reporting the most recent contributions on the codices provided on the occasions of the exhibitions of the last decade. If only the long bibliographies of these scholars could melt down so as to adopt the same policy! I prefer not to copy here the list in question only because it focuses, as indeed does the whole book, especially on the manuscript of the Triumphi under examination, Laurentian Strozzi 174, and does not pretend to cover the sector in general. 2. I. G. Rao (ed. ), Francesco Petrarca, i Trionfi. Castelvetro di Modena 2012. All or most academic studies understandably turn great attention to the possible sources of Petrarch, both for the whole of his triumphs, and especially for the detailed description of each. It seems to me that the two references from the past with the greatest interest are those that put the work in connection with the other two greats that lie at the basis of Italian literature, Dante and Boccaccio. 3. G. Guerrini, Scrittura e civiltà, 10 (1986) 121-197. 4. C. Dionisotti, Italia medioevale e umanistica, 17 (1974) 61-113.
who composed for quite ignorant readers (and listeners, probably even more numerous). Well, technically speaking, Petrarch in his later years adopted a style that, if it was not exactly Dante’s, surely approached his much more than all his previous poetry. If the contact with Dante was indirect and questionable, that with Boccaccio was real and repeated. Most frequently mentioned is the Amorosa Visione and the meetings that the two great writers had in person. The discussion among scholars today mainly concerns the details and the precise extent to the Amorosa Visione and the Triumphi influenced each other, until eventually in the first poem is found the origin of the second. For literature these problems are very important, but the repercussions for our question of the origin of the triumphs-cards is poor: it is true that to pass from just six triumphs of Petrarch to the number of those extractable from Boccaccio's poem can facilitate the attainment of the fateful number of twenty-two triumphal tarots, but in fact the figures described clearly in the Amorosa Visione are actually fewer than the six of Petrarch and all the other factors determining - virtually at will - the many supporting characters. Although this is a well known fact mentioned by all the commentators, I have not found studies that are dedicated in particular to the structure of Triumphi as elements that surpass, and even more generally to the study of what had precede them - except for some vague references to the Psychomachia of Prudentius - and what were later imitations, not of individual examples, but the complete set (perhaps with the same extensions that would be useful for our particular purposes). and also later. Of the sources to be examined for an investigation of this type there is no limit. Before - and in my case instead of - going into the details of the individual depictions, we immediately meet a serious problem that involves all of the figures of Petrarch's triumphs, or at least all but the first, the Triumph of Love. This surprising fact can be seen as the result of two unexpected observations: the figures that illustrate the Triumphi do not match their description in the poet’s verses; also the choice of how to complete the illustration is not left from time to time to the painter's imagination but follows virtually a fixed pattern. That the figures are not drawn according to the text is seen at first glance, even without placing one’s attention on the many details that would confirm that conclusion, by the very fact that all the triumphs are presented with triumphal carts pulled by pairs of animals, while in the poems only the first triumph is described that way. That the scheme of pictorial representations is shown repeatedly without significant changes can go to confirm a hypothesis that was advanced in the first study that seriously addressed the problem: all known miniature cycles would be derived from a prototype now missing. A second hypothesis, put forward shortly after, instead saw the Triumphi as derived from triumphal processions (6). The question is not a minor one and has been discussed at length; for those wishing to reconstruct the essential features I find nothing better than to go back to a book already mentioned. This time the contribution is by Ada Labriola in her study that already shows itself of interest from its title (7). The contribution is devoted primarily to the already mentioned Laurentian manuscript, with its beautiful miniatures by Apollonio di Giovanni, but also examines the background and general context, in a concise, dry style, very rare among historians. For the question now recalled, the suggestion is as follows. 5. V. M. Essling, E. Müntz, Pétrarque, ses études d’art, son influence sur les artistes, ses portraits et ceux de Laure. Paris 1902. 6. W. Weisbach, Repertorium für Kunstwissenschaft, 26 (1903/04) 226-287. Limentani Virdis 2006, pp. 107-123; Prieto Gilday 2007; Malquori 2010, pp. 79-87. There can also be indicated in this regard a brief contribution by Esther Nyholm, summarizing the issues well (8). They may seem as numerous as the studies on the subject, but they are no more than a small part of the bibliography, and finding them already selected as essential can be of considerable help. The contributions of the historians of art and literature can, and indeed must, be combined, at least in this case; there may also be contributions from other disciplines. The most interesting work in this direction that I know is the thesis of Alexandra Ortner (9); it is a beautiful collection that brings together nearly five hundred pages of results that would otherwise require the consultation of works from numerous disciplines. The main merit of this author, briefly, is to combine, in triumph after triumph, what is known separately from authors who are interested in literature, art historians (ranging from illuminations to marriage chests [cassoni] and birth trays), and even historians of the theater, public events and ceremonies of the time. For our particular purpose of tracing the series of twenty-two triumphal cards, already the combination of all six Petrarchan triumphs appears very limited; at the least an overview of the combination of the whole group would be useful, in so far as it then remains insufficient. It is true that many devotees of the tarot are deeply interested in the deeper meaning of each of the "major arcana", but for my part I find more interesting problems that concern the whole series, however reduced. 8. K. Eisenbichler, A.A. Iannucci (Editors), Petrarch’s Triumphs. Allegory and Spectacle. Ottawa 1990. 9. A. Ortner, Petrarcas “Trionfi” in Malerei, Dichtung und Festkultur. Weimar 1998.
historians of playing cards) it is essential to reconstruct in context the movement of the personages, one exiting while another takes over; there is necessarily a precise order to be respected. It ends up explaining very well why the majority of authors have put the Triumphi in relation with processions, and in particular with triumphal parades of floats. It would be enough to find a parade in which the carts were dedicated precisely to the six Petrarchan triumphs, and an excellent candidate would be identified for the inspiration of both the Triumphi and, similarly, our triumphs-cards. This logical hypothetical step, which is also suggested repeatedly in the literature, appears contrary to reality (as often happens for the reconstructions based on the logical distance of centuries): it may happen to find traces of parades inspired by the Triumphi, and even by tarot cards, but not vice versa. Several studies have found that in the first half of the fifteenth century the spread of manuscripts of Petrarch's works among the Florentine citizenship was rather marginal in comparison to the works of Dante and Boccaccio, after which the works of Petrarch, starting precisely with the Triumphi, were to take over. In this regard, of particular interest are the findings of Christiana Bec’s studies on the libraries of the families of merchants, with a clear distinction between the two halves of the century (10). In the Florence of the Medici, the teachings of contemporary history and the humanists brought profound consequences. The merchants and the upper middle class [alti borgesi] have given up some of their "civic" inspiration readings and both renewed and enriched their libraries, showing a strong interest for works of classical authors, for Petrarch and and for modern writers. Therefore, if the Florentine public of the early fifteenth century opens itself, as we have attempted to show elsewhere, the cultural renewal of his time and determines it to a certain extent, the rich merchants of the second half of the century participate directly in literary humanism and interest themselves in contemporary book production. Florentine writers and humanists of the fifteenth century enjoy a wider audience than the medieval thinkers in that they are "intended"
10. Ch. Bec, Cultura e società a Firenze nell'età della Rinascenza. Rome 1981, p. 18.
not only for professional scholars but for "honnêtes gens" [honest people]. In the Quatrocento [15th century], in short, culture comes out of the cloisters and the university to enter the shops and merchants’ palaces. More recent studies have reassessed the importance of Petrarch also for the previous period, toward the conclusion that some of his writings had a considerable dissemination in the mercantile environment even before the development of humanism (11). ... A political interpretation of certain texts of Petrarch, as witnessed in manuscripts for the most part only by the fifteenth century, probably also occurred in Florence in the late fourteenth century, at least in the circle that revolves around Luigi Marsili; this Florence, however, is not yet the Florence of the humanists, but just that of the merchants. Also, knowledge in Florence of the Triumphi in particular advanced quickly, but only in the narrow circles of the early humanists and their friends, including merchants. This type of diffusion among a few experts on the matter persisted, even for decades, after the poet's death. The manuscript copies that circulated were unpretentious and without illustrations, often personally copied by humanists and some merchants, without the involvement of scribes, much less illuminators. It was the rule of the miscellanies, where the Triumphi could be seen with other writings on various subjects. For decades, the text of the poem is separated from the cycle of illustrations, which then will accompany it. In the study just cited this change is taken into account, described as follows. 11. S. Brambilla, Verbum. Analecta neolatina, VII/I (2005) 185-219.
authors; in others, the Triumphi are united with religious texts, moral or devotional, traditionally close to the interests of the merchants; in still others of didactic texts, prayers and vernacular letters, sometimes about politics, which we will see in part accompanied by at least one other work of Petrarch, the Fam. XII 2, in the vernacular. Going forward to the second half of the century, however, codices contain only written Petrarchian writings or those related to Petrarch, like the Life by Leonardo Bruni. They are modeled on similar examples of luxury codices, humanistic monographs, and at least in part testify to the influence of the most advanced culture also on products destined for a different audience. Indeed, as also recognized in the citation, great credit needs to be to given to the previous studies by Gemma Guerrini, which are based on the meticulous examination of many of the fifteenth-century manuscripts of the Triumphi. In addition to the more extensive one already mentioned, another article cannot be forgotten, in which she presents the question from several points of view, bringing the analysis to a conclusion that, although not defined as final, certainly does not appear rushed (12). 12. G. Guerrini, Accademie e biblioteche d’Italia, 54 n. IV (1986) 12.-33. These two works of Guerrini have given rise to a considerable change of perspective in the association between the Florentine merchants and the Triumphi, anticipating by decades the observation of their frequent dissemination and the continuation of popular compilations even when the most exclusive manuscripts appeared. Although it may seem far from immediate, the fact of the appearance of illuminated manuscripts alongside the continuing production of those ordinary manuscripts already present in the first half of the century, appears as a modification of the "editorial" form of the environment of the main readers. The emergence of the Triumphi, recognized as a literary work of the greatest importance deserving to be compiled individually in an exclusive manuscript, happened, however, at a later time, when in Florence there came the extraordinary flowering of those precious manuscripts, which we can discuss again separately. least in central and northern Europe in the following centuries the fashion lasted longer; overall the Triumphi can be considered one of the works that have enjoyed the greatest spread throughout Europe, both in literature and pictorial art. Probably the reason for this popularity in Florence is mostly social. The writings of Petrarch were much appreciated in the courts and it can be said that - unlike Dante - the poet meant to write precisely to, and only to, the highest levels of the society of his time. Thus if in an Italian court a duke commissioned a fine edition of the Triumphi, none of his subjects would have dreamed of imitating him. The situation was completely different in Florence: first of all, there was no lord of the city yet, and there was a continuous race with no end among families, because none prevailed too much over the others; only subsequent events make us realize that the Medici family was to rule all. After the fears that followed the tumult of the Ciompi in 1378, with the following restoration, it had become necessary for the ruling class to make fully manifest their right to govern the city. To present themselves worthy of their political and social role the higher leading families resurrected traditions fallen into disuse and returned some customs and events current that in the past in Florence, and also at the time in other cities, were used to distinguish the nobility from the people .. It must be remembered that in Florence the families involved were no longer those of the nobility (kept out of public office according to the Ordinances of Justice) and around the new prominent families there were many more that approached oligarchic status and aspired to be part of it. In this race of emulations and continual imitations also were also the works of art commissions and, in our case, the illuminated manuscripts of the Triumphi. The codex reserved for a few people in other Italian cities, and not yet beyond the Alps, was requested in Florence in dozens of copies. Something similar probably happened for the Florentine fashion, almost simultaneously, of the first triumphs-playing cards, but for that it is more difficult to set the starting date. 13. G. Milanesi, Lettere d’artisti italiani dei secoli XIV e XV. Roma 1869.
cycles of miniatures of the Triumphi before that time and from that document it is clear that there was still no standard practice in depicting those images. The question that the illuminator puts to the commissoner is not about the depiction of a small detail, for the buyer’s preference, but a group of important aspects of the scene. In short, for many illuminated Petrarchian codices in Florence in the fifteenth century (some of which are now today in distant libraries) we not only see a fashion flourish, but in practice also its beginning, dating from shortly after 1440, for us a date very close to the notice we have about a parallel fashion in the triumphs of playing cards; in essence also, too close to be able to conclude that in Florence, the illuminated Triumphi influenced the triumphs [trionfi], as based on the dates that appear it is more likely vice versa, also because it is not known how many could have been in circulation before the new playing cards, of which we lack information on when they started to appear. On the other hand, a similar time-inconsistency has already been found in Florence for the fashion of triumphal motifs in birth trays (14) and wedding chests (15). Commenting on the six triumphs of Petrarch is also not easy at the amateur level. On the one hand it is useless to repeat what everyone knows or can find at once in a thousand publications. On the other hand it is impossible to take account of everything that has already been written; it is difficult to use even one of the fundamental contributions of professionals, as already seen at the beginning. progression of a person who triumphs over the previous year. This is the fundamental character that is required for a scale of values necessary for the simple card game, at least as often as - as happened with the triumphs at the beginning - you do not enter the numbers of the series directly on the cards. If one considers using six playing cards with representations of Petrarch's triumphs, everyone will know which card captures another. If necessary, one may wonder if we would come to the same conclusion with the same pictures without the intervention of Petrarch, and then eventually back to the sources from which the poet was able to derive his own "scale of values". Sometimes in studies of the Triumphi the Psychomachia of Prudentius is mentioned as the distant origin of an entire genre of literary works and paintings, of which one part would be the works of Petrarch; but there it is mainly about virtues overcoming vices, presented as a different kind of triumphs that, although part of a single setting, follow each other independently. At our level, we can be satisfied with Petrarch's poem without being concerned with any of the above, and from there move forward in our direction. 16. R. Fusi, R. Pio, Tarocchi un giallo storico: Le carte perdute e ritrovate. Firenze 2001; reprinted in 2004 with the title: Petrarca, Simone Martini e le carte. 17. F. Pratesi, Giochi di carte nella repubblica fiorentina. Ariccia 2016, p. 504.
kept in a rather secret form, before the death of Simone Martini (1344), and Petrarch (1374). As for me, I'm always looking to set back the date of the origin of our triumphs, but this is excessive; we can only comment briefly: "You are too kind, Saint Anthony!" Perhaps the most daring result of that book is that from the Triumphi would be derived not only the triumphal tarot cards, but the whole pack, including the number and picture cards. It is better to reduce our expectations and limit ourselves to less ambitious considerations. After taking into consideration the opinions of the "serious" scholars, we have arrived at a point where we have had to turn to the contributions, at least apparently less fundamental, of the collectors and amateur historians of playing cards. It should be noted that these contributions are not, as one might expect, a kind of appendix to those published by academics, but come to fill a space that the "scientific" studies have left blank, the correspondence between triumphal tarot cards and the Petrarchan triumphs, which, once accepted, becomes the point of our greatest interest. At the base you have assumed that there really is a match, otherwise Petrarch, despite all his recognized importance as poet laureate and proto-humanist, would serve no purpose for the topic that interests us. An historical connection between the two groups of subjects (as I was reminded by Ross Caldwell) actually comes from the environment of playing cards, from that of minchiate in the seventeenth century: Paolo Minucci comments on the order of rank among the superior cards of the game and ends with the similitude of our interest. l Petrarca similmente ne’ Trionfi fa come un giuoco; perché Amore è superato dalla Castità, la Castità dalla Morte, la Morte dalla Fama, e la Fama dalla Divinità, la quale eternamente regna. We mus not give to this quote, and in particular that "similitude", more importance than it has. Everyone knows the Triumphi; everyone knows the minchiate, or at least everyone knew them at the time; Minucci does not look for a deeper partnership between the two parties: speaking of minchiate, he just wants to point to the fact that even in it, as in the Triumphi, there is a ranking: the element that follows is more powerful than the one that precedes it. Everything is here, but this point remains of course very important for us always to keep in mind. In fact, the two groups of successive subjects are often mentioned together, but without explicit attempts to match them element to element. We can even conclude boldly that there is no match, but here we are interested more in hypotheses that suppose it. Meanwhile we see what we can expect from that comparison. It seems to me that the results can be grouped into a few different types, aside from the problematic task of having them associated with twenty-two objects. Then the first development that can be imagined is to identify the similarity among the six Petrarchan triumphs and the same number in the cards. For attaining the result, several options are opened for how to consider the sixteen triumphal cards left unmatched. One possibility is to consider them in whole or in part still linked to Petrarch, maybe finding the Triumphi figure matched not with one but two or four of the tarots; another is to investigate a different origin, completely independent of the Triumphi. It seems unlikely that a pack of cards existed in which the triumphal cards were only six, like the Triumphi. The sequence may have formed gradually, however, such that our task is not to seek a correspondence between the six and twenty-two items, but rather only among a group of six, and, typically, another group of fourteen or sixteen triumphal cards, that is, as many as would hypothetically be present in the first packs, all of them independently of the Triumphi. an amateur level, including the authors of some of the mentioned proposals. This association is an obligatory point of reference for those interested in the tarot in Italy, and even beyond, thanks to the untiring work of study, dissemination and coordination of various high-level contributors by its founder and president, Andrea Vitali. Here I use the catalog of their international exhibition organized through the patronage of the Ministry for Cultural and Environmental Heritage (19). In the catalog, in part reproduced also in the association's web pages (20), we can read that the Triumphi were at the origin of the tarot; this statement does not come very unexpectedly, its originality is found, other than in the Prince, in the reconstruction of the triumphal cards guided by numerology, ending in the fateful 22. In what follows we consider some proposals on the correspondence between triumphal cards and the Triumphi. These cases were reported to me by experts who, like me, are interested in the subject at an amateur level, including the authors of some of the proposals mentioned. This game derives from the Triumphi of Francesco Petrarch, in which the fourteenth-century poet describes the six major forces that govern men and assigned to each a hierarchical value. The Romanesque numerology saw in the number Six the "superhuman power" because it corresponded to the days of biblical creation. .... 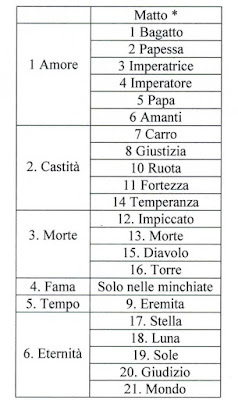 The number of triumph cards, the conception of which is due to Prince Francesco Antelminelli Castracani Fibbia, seems to have been originally composed of 8 allegories, later 14 and 16, to settle finally on 22, a number that in its Christian mystical meaning is the introduction of the wisdom and divine teachings engraved in humanity. This path, which declares in a progressive adaptation of these numerological "playing cards" dictates of a religious nature, was likely to have been adopted to avoid the condemnation by the Church that had repeatedly been hurled against card games that were considered gambling. Missing here an explicit one-to-one correspondence between the Triumphi and the cards, but we will find this in other studies. 19. A. Vitali (ed. ), La carovana dei tarocchi. Turin, s.d. [In Italian at http://www.associazioneletarot.it/cgi-b ... aliano.pdf, in English at http://www.associazioneletarot.it/cgi-b ... arovan.pdf; in French at http://www.associazioneletarot.it/cgi-b ... r_sito.pdf]. 20. http://www.associazioneletarot.it/page. ... 11&lng=ITA [in English at http://www.associazioneletarot.it/page. ... 11&lng=ENG]. of the first triumphs, and they formed a larger part than usual, as the first triumphs would be 16, made precisely from all six of Petrarch, in addition to the seven virtues and the two cards of the Emperor and Empress. At this point you get 15 of the 16 triumphal cards hypothetically present originally. It is therefore only remains to seek the sixteenth card, which according to Howard would be the Wheel, which is one of two surviving triumphal cards in the Brera-Brambilla deck made by the same workshop and is one of the most obvious allegories of the Amorosa Visione. This interpretation has been used by Howard to propose a possible reconstruction of the Cary-Yale deck, inclusive of the cards that have been lost (21). He is probably the most prolific animator of discussion on the triumphs that can be met on the Internet, as much on his website Trionfi.com, as in the Tarot History Forum; there is no sector in the history of tarot where he has not opened a new discussion exploring, forgotten contributions, always on the web, that no one would be able to fish out in a comparable amount from old texts, German or otherwise. 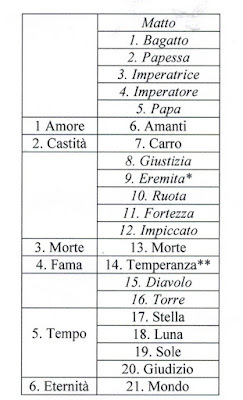 Also in this case he has a theory to propose, where there are mostly clear associations between tarot cards and the Triumphi, reported in the following table (22). Where the association is not there – the cards in the table printed in italics – it means that those cards were added independently of the Triumphi. The correspondence is almost one to one, but there are a couple of exceptions, which concern Time. It would be quite unusual to associate it with the Hermit, but here that association is so present, but secondarily and with a question mark; the reason is that time is preferably associated with four of the tarot cards, three as measures of time - year, month, day respectively for Star, Moon and Sun - while Judgment again has to do with Time, as it is its end. 22. L. Teikemeier, email 06.10.2016. * Indicating here, understandably, a correspondence added with a question mark to 5, “Time”. **Association justified in the case of Temperance depicted with wings. To include Moakley among the amateurs seems indeed a bit reductive. Her profession would have been that of archivist; distinguishing whether her involvement with the tarot was amateur or professional seems to me a matter of splitting hairs, especially for her book, a pioneering contribution discussed in all monographs on the subject (23). The book is of interest even today, after half a century, but here we have to go back a decade, to her article centered on our topic, of which I did not know and was informed of it by Ross Caldwell (24). I report it in the form of the proposed table, with minimal changes, such as including the Fool at the beginning, rather than the end, the only card for which a match is not given, since it is outside the series; for all the other cards - receiving help from minchiate - there is a correspondence with the Triumphi, naturally with appropriate groupings. 23. G. Moakley, The tarot cards painted by Bonifacio Bembo. New York 1966. 24. G. Moakley, Bulletin of The New York Public Library. Vol. 60 No. 2 (1956) 55-69. Moakley reports a couple of features that make her proposal appear particularly valuable; one is that even within groups corresponding to only one triumph of Petrarch (the card at five) one can identify a ranking in accordance with the position in the group. The circumstance appears even more significant, emphasized by her, that the modern order of the cards did not need a significant reshuffling, having only to put out of order the cards ranking number 9 and number 14. __*Not part of the procession. parody of the carnival type, with almost burlesque transformations of the personages involved. A number of studies of Petrarch's Triumphi have been examined, focusing especially on the few that have proven useful for our point of view, aimed at the interest of the subject in the history of playing cards. In some images found in the tarot, there appear obvious similarities with those of the Triumphi; to better compare the two groups we cannot use the text left unfinished at the death of the poet in 1374, but that accompanied by the fine illuminations which became, particularly in Florence in the mid-fifteenth century, a highly sought-after book, just when also the triumphs-cards had, in Florence, their first diffusion. As seen in Florence for the fashion of triumphal motifs in birth trays and wedding chests, it is likewise for that of the illuminated manuscripts of the Triumphi, it would seem that they all exclude a direct influence on the origin of the triumph-like playing cards, because of the latter we have notice in 1440 and probably were already known some years before, when the Florentine fashion for the other objects of the minor arts decorated with triumphal motifs was not yet widespread. This applies to the associated picture cycle, but not to the text of the Triumphi which also previously had an appreciable movement in Florence. I want to clarify something about the proposal credited to me in Franco's note above. First, the application to the Cary-Yale is not due to me, but to Huck, in his "chess analogy". However he does not necessarily support the Wheel and the Old Man as what corresponds to the bishops in chess. I support this association because the Wheel and the Old Man have in common, in the Brera-Brimbilla (for the Wheel) and the PMB (for both)an old man, thus forming a pair, and bishops were conventionally thought of as men of advanced maturity, even if in practice political appointees were sometimes given this position as children. The other pairs are the Angel and the World, (both with castles, like the rook in chess), the Chariot and Death (both with horses, like the Knight in chess); and the Emperor and Empress (both with crowns, like the King and Queen). Second, it is not for me quite a hypothesis for the original tarot, but just for the connection between the deck of Marziano and the Cary-Yale, which might also explain some of the origin of minchiate. It is not part of the hypothesis to exclude earlier versions of the tarot, perhaps in other cities, which the Cary-Yale would have built on in light of Marziano. Nelle note alla Terra desolata T. S. Eliot scrisse: «non conosco la costituzione esatta del mazzo dei tarocchi». Non esiste, in realtà, nulla del genere; esistono più forme distinte del mazzo dì tarocchi, ciascuna diversa dall’altra per composizione. I will discuss Huck's and Moakley's proposals in another post. mikeh wrote: I genuinely didn't know about the 7 virtues on the Signoria and hadn't considered that other depictions (Baptistry doors, although with Humility as well) represented a trend. Your question remains: Why would the Florentines have removed the theologicals from the tarot before 1450, if they didn't remove them from her other personal/civil commissions of the virtues? Of the numerous monumental representations of the Virtues in Florence one finds the Cardinal and Theological virtues everywhere there: on the Campanile, on the Loggia dei Lanza, on the Baptistry doors (albeit with Humility for symetry's sake on the rectangular doors), the three theological virtues inside the Baptistry on the tomb of Antipope John XXIII by none other than Donatello, the cardinal virtues above the tomb of Cardinal of Portugal in S. Miniato by della Robbia, all 7 on the spalliere above the magistrates seats in the Mercanzia by the Pollaiuolo brothers and Botticelli, on the wall of the Spanish chapel of the Aquinas fresco, Redeemer and the Seven Virtues on the ceiling of Santa Felicita, etc. You'll note that the two examples where the Theological virtues stand by themselves or are removed, there are arguably Papal-related explanations: John XXIII's tomb is obviously papal and the Cardinal of Portugal was not a pope, and thus not privy to that explicit identification (so strong was the papal prerogative). The general point is the Seven Virtues were enduring throughout the late trecento/quattrocento and widespread through the city, writ large on many of the most important monuments (Baptistry, Loggia dei Lanzi facing the seat of government and its piazza, Campanile and Mercanzia). As for the mention of "three celestials", I take it to mean you believe in the extremely weak hypothesis that the theologicals were replaced by the sun, moon, and "star" (clearly Venus in the PMB, her earliest depiction), although there is nothing that supports that assertion. As for Dante, they rarely discuss parallel content, although sometimes they recall also some of the Dantesque visions of the Paradiso or other works. More than anything else Dante becomes involved for his style, beginning with the adoption in the Triumphi of the same tercet of the Commedia, anything but common in previous productions of Petrarch. By contrast, the culmination of Dante's Purgatorio is when he beholds the Church Militant and chariot (foreshadowing what is to come in the Paradiso), where the seven virtues also appear (Purg. 29: 121f). Here we are nymphs and in heaven we are stars. What Dante means is that each of the 7 virtues is associated with one of the seven planetary spheres through which he will ascend in the Paradiso, and seven themes exemplifying the virtue/planetary quality (7 virtues, 7 planets [not 3], 7 themes, with a God-denying Fool appended to get to 22). Petrarch comes nowhere near the number of trumps, not even in the individual trump of the Lovers. Its all an ad hoc game of forcing 6 squares into 14, 16 or 22 round holes. The bottom line: the virtues are known in the earliest surviving tarot deck and it is Dante, not Petrarch, who makes the greatest poetic use of them. And it is Dante, courtesy the likes of Bruni and Palmieri, who is reclaimed by Florence in the 1430s, right before the earliest evidence of tarot. My appeal to the 7 virtues for the CY is based on the number 16 from the Marziano and its assignment of 4 triumphs to each regular suit. It is a separate source from Petrarch. You do not have to read Dante to know about the 7 virtues, even in Milan. In Visconti illuminations, the closest iconographic relationship is to those in the Song of the Seven Virtues and Seven Liberal Arts, done in Bologna but appropriated by the Visconti in Milan. It is simply a third group, unrelated to Petrarch. Here is the list of surviving CY cards (in the minchiate order). Empress, Emperor, Love, Chariot (Chastity), Fortitude, Death, Faith, Hope, Charity, World (Fama), Angel. Looking at this list, what comes to mind, at least mine, especially if I know the game is "triumphi/trionfi", are (1) Imperatori; (2) Petrarchan triumphs; and (3) the cardinal and theological virtues. To make 16, one more Petrarchan-like triumph is required, for which the Wheel is the logical choice. One could make the list fit Dante, I suppose, because just about anything medieval is in Dante, but it is not what comes first to mind. Petrarch's poem Triumphi/Trionfi comes to mind even without the list. Yes, Dante used the 7 virtues; but it isn't something one associates to Dante in particular. I have commented on Moakley's way of applying the 6 Petrarchans to the 22 tarot triumphs at viewtopic.php?f=11&t=1120&start=10#p17833. mikeh wrote: My appeal to the 7 virtues for the CY is based on the number 16 from the Marziano and its assignment of 4 triumphs to each regular suit. You already lost me - what does a series of 7 have to do with the number 16 or being subdivided into 4 suits? Why not just round up the 7 virtues to 8 with Humility, for which you have contemporary examples? The problem is there are zero tarot examples with Humility. At all events, relating Marziano to the 7 virtues is pure gibberish, for first of all his game is 'fitted to the serious man wearied of virtue', and his 'Virtues' are 4 - Jupiter, Apollo, Mercury and Hercules - and their suit is Eagles. Besides Hercules and Fortitude, gibberish. mikeh wrote: To make 16, one more Petrarchan-like triumph is required, for which the Wheel is the logical choice. 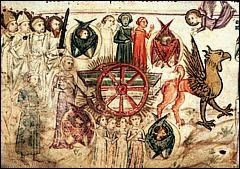 Why is the Wheel a 'logical choice' for 'one more Petrarchan-like triumph' when those triumphs are not cyclical but hierarchical, ending with Eternity (or as you would have it, the Angel/Judgement)? "Love", to be associated with Justice, must be seen as primarily a contractual relationship with an allotment of obligations to each party. Justice is served by honoring the contract. The next triumph listed is Charity, assigned to Cups: http://brbl-dl.library.yale.edu/vufind/Record/3432620. So, according to my 4 cards per suit reconstruction, one is missing from Batons. I propose that it is the Wheel, in part because it appears in the Brera-Brambilla. Everyone in life is subject to Fortune, and Faith, Hope, and Fortitude are all virtues which help in dealing with the vicissitudes of fortune. It is fitting that they be grouped together. Besides Charity, Chariot (i.e. Pudicitia) and Death are assigned to Cups. The missing fourth would be a cardinal virtue. either Prudence or Temperance. I propose Temperance, as related well to the other three, better than Prudence: Temperance, in the sense of moderation of the appetites, facilitates Pudicitia (sexual morality as appropriate to a married couple, including dress but especially fidelity, defined differently for the two sexes), delays Death, and facilitates Charity with the resulting surplus of material goods. These things go together. Finally, both Fame (World) and the Angel are assigned to Coins, in that order. Although Prudence is often associated with material wealth, i.e. Coins, it more properly is associated with one's eternal reward. The virtue of Prudence fits both of these. You have yourself argued for the CY Fame's association with Prudence--but I would say association rather than conflation. It seems to me that Time, another missing Petrarchan, fits perfectly well here. So the Petrarchan order Love, Chastity, Death, Fame, Time, and Eternity is fully respected, but inserting Fortune between Love and Pudicitia. I would guess that the old man with the Hourglass is the image, because it verifiably appears in the PMB. However the Sun is also possible and might have appeared in the PMB. I cannot say precisely what it would have looked like. Since the PMB Old Man looks much like the Charles VI Old Man, it might have looked like the Charles VI Sun. Or, alternatively, the PMB second artist Sun. Either fits, but the PMB more optimistically, if it means rebirth. Another reason for supposing that the missing cards are the Old Man and the Wheel is that there are old men on both. The other 5 Petrarchans also form pairs, although one Petrarchan, the Petrarchan, is paired with two cards: Love, both of which has a marriagable man and woman (arguably the same man and woman), and Death, which like the Chariot has at least one horse. Likewise both Fame/World and Eternity/Angel have towers (and trumpets, too). These pairs also fit the chess pieces: bishop (old men), knights/horses, rooks/castles. The Emperor and Empress also form a pair, with crowns like the King and Queen of chess. The seven virtues plus Love, as Philia a virtue, make the pawns, as Huck has worked out. One more reason for the Wheel is that the Visconti liked to be reminded of Fortune's Wheel, painting a big one in their castle on Lake Maggiore, as you pointed out to me. Another is that it is one of the triumphs in the Amorosa Visione The others were Wisdom, Riches, Worldly Fame, and Death. There might be another at the end, not named as such, as there seems to be some sort of triumph over death. It is what Petrarch, after Boccaccio, will call Eternity. I hope that clarifies my hypothesis, based on evidence (for 11 cards) plus reasoned speculation (for 5 cards and the whole). The Wheel fits into the Petrarchan hierarchy very well. The order, of course, is quite different from that known in the later lists. That is only to be expected if the cards of the CY-type went to another city that found that order not very pleasing and re-ordered them in a way that suited them better and proved popular. A rule change, in other words. Then the old order, to the extent anyone still in Milan knows it, is associated with the hated Filippo, and a new regime comes in with a new order, in cards as in life, but with minor changes at some point, to match new needs and perceptions. One question ... where do we have this Beinecke list of trumps, from which it was said, that it was delivered with the cards? The unique addition of the Female Knight and Female Valet may be an indication that this pack was intended to be used by a female member of court. Physical Description: 1 card col.19 x 9 cm. The rest are similar, except that after the first couple the suit is given in parentheses, i.e. Faith (Batons). These suit assignments came with the cards, when the Cary family gave them to Yale. At least that's what the curator said when I emailed him, 10 years ago. I still have the email. There are no 15th century documents, as far as I know; he didn't elaborate. But it seems to me too unusual, and too outside any normal way of ordering the cards, to be likely to have been made up by anyone since. Nobody ever assigned trumps to suits, not since Marziano, much less grouping the cards the way they are. Hardly anybody even knew about Marziano . And if they did, they wouldn't have connected those Olympian gods, and their assignments to non-standard suits, with the tarot. However these odd assignments that Yale inherited fit Filippo's way of thinking quite well, not only as co-designer of the Marziano, but also as a member of the family that employed Petrarch, valued him highly, and acquired his manuscripts after his death (other than the autographs), yet could give those Triumphs such a new twist, in accord with his own thinking about these six subjects. Note: I added the part in quotes a few minutes after posting. I would have liked to know what language the note that came with the cards was written in, with the actual words used, as opposed to the ones that the curators might have inserted that would identify the cards for the modern reader. That part, the individual words, is clearly not original. But it remains someone's translation of what they were given, whenever it was done and whether someone else had translated it into some intermediate language before the one in English we have. Yes, would be nice to know the details of the background. Is anything known about the earlier owner? Kaplan says the Collection Visconti di Modrone. ... the date of the sale 1947. I remember, that I once saw closer details in one of the Tarot forums.